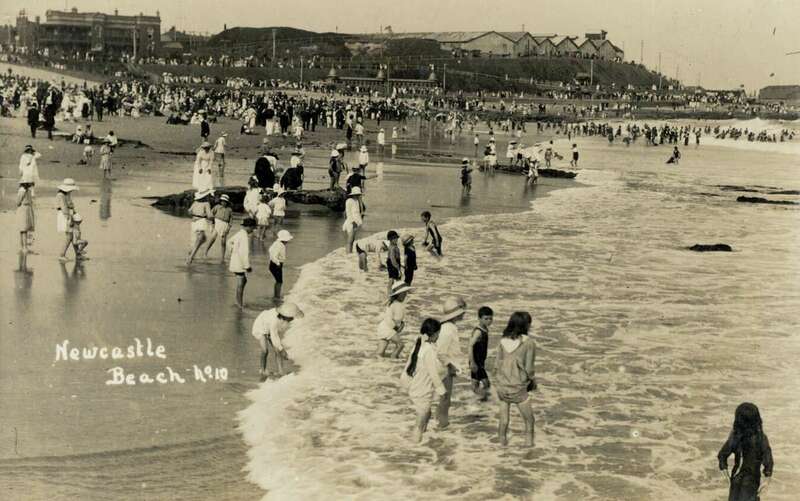 Beachgoers at Newcastle, c1910. This period saw Australians embrace swimming at the beach for leisure. ANMM Collection ANMS0551. In this island country, the coastline stretches over a distance of more than 36,000 kilometres, so it’s no surprise that Australians are obsessed with water, beaches and water sports. It is this obsession with water that has contributed to Australia’s reputation as a nation of swimmers, surfers and beach goers. With the introduction of paid holidays and leisure time for families, Australians crowded the beaches making them the place to be. Prior to 1800, in Europe, swimming and bathing were associated with health and medicinal treatments, but in Australia, the Indigenous population used the waterways as a source of food, enjoyment and connection to the land. As early as 1900, Australia was already a beach going nation and by 1910, swimwear was already produced by the local knitting mills and wool was the preferred choice of fabric for bathing garments. Edwardian women’s swimming costume, c1900. ANMM Collection 00016509. Initially, Australians wore homemade bathing costumes based on overseas pattern books and magazines, or readymade swimming suits from mail order catalogues. The neck to knee outfits for both men and women were the norm, but as the need for more comfortable bathing suits grew, the concept of swimwear changed dramatically. A need for a special costume that retained modesty but enabled the wearer enough movement to engage in sports, became obvious. 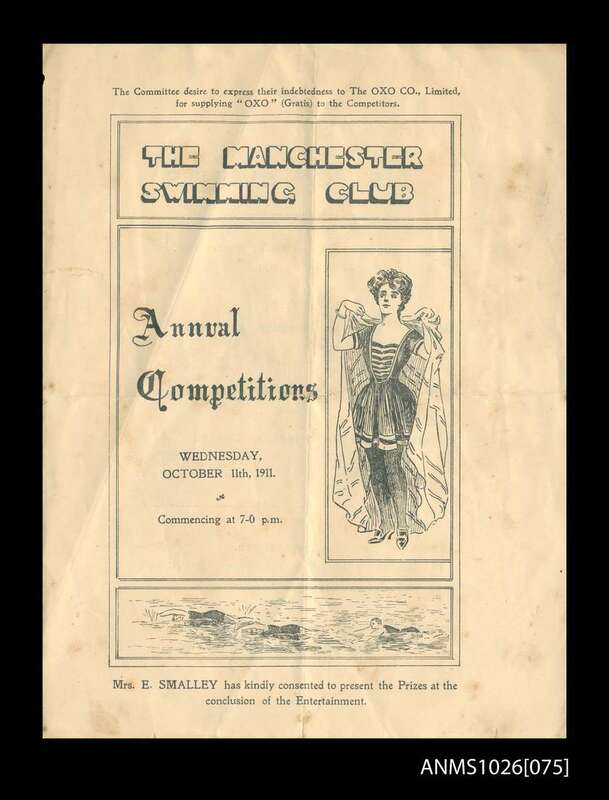 Program for The Manchester Swimming Club, October 1911. ANMM Collection ANMS1026. From the 1920s to the 1930s it was a liberating time for swimwear designers such as Peter O’Sullivan (1904-1977) as new fabrics like lastex, a yarn with rubber core encased in wool, silk, rayon or cotton threads, was introduced to the market leaving the cumbersome and, heavy when wet, wool behind, giving the designers more freedom to create a more daring and figure hugging pieces in a variety of colours. 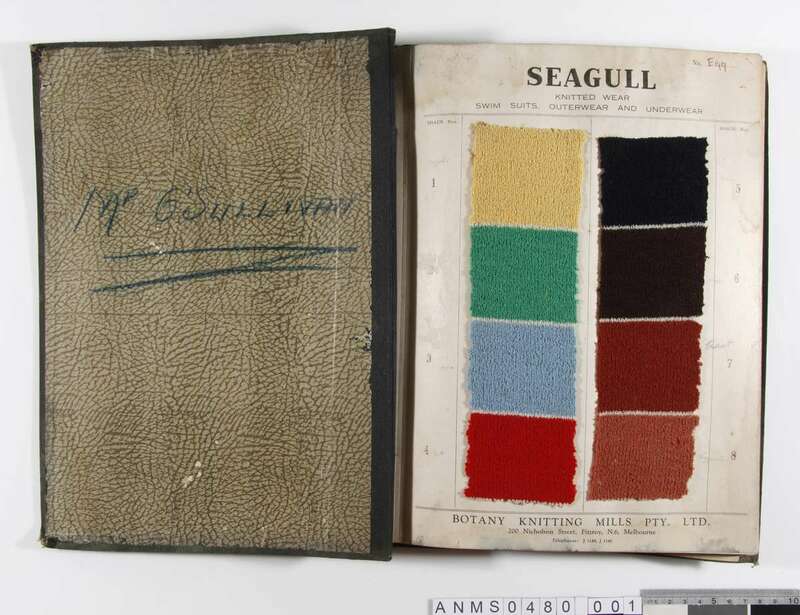 Botany Knitting Mills fabric swatch book 1930s. ANMM collection ANMS0480. The public accepted the shrinking swimsuits trend, but the government put up resistance – especially to men exposing their chests by wearing trunks. This daring style was met with public protests and by the end of the 19 30sbeach inspectors refused to uphold the by-law allowing swimwear to become shorter and sexier. After leaving his family farm in Inervell, NSW, Peter began labouring in wheat silos at the age of 14. He then purchased a motorcycle franchise, moved to Sydney and had a couple of jobs involving car and motorcycle repairs and servicing before switching to swimwear design and manufacture. O’Sullivan was one of the firsts Australians to successfully design and manufacture swimwear to export to America. From his Melbourne Botany Knitting Mill in Prahan, Peter incorporated imaginative design details such as buckles, decorative buttons, contrast trims and polka-dot patterns. He understood that the market was demanding an elegant and streamlined approach to swimwear and so he created a range of designs that accommodated for sunbathing which was both practical and comfortable for swimming. For the men, he designed the ‘Bucaneer’ style with a detachable top that could be easily be removed to become swimming trunks and then, re-attached for more coverage out of the water. For women, he designed the one-piece maillot with halter necks and V back cuts that were suitable for swimming while exposing more skin to the sun. 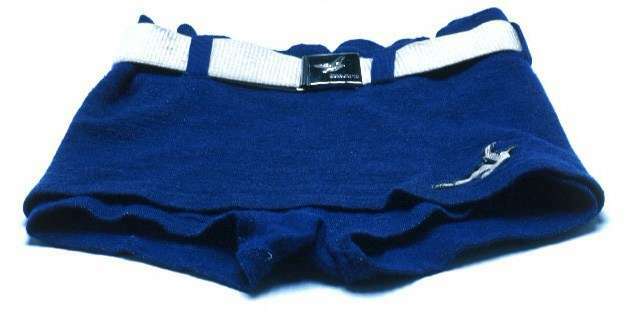 His brands, Black Lance and Seagull Water Fashions, were part of the top Australian swimwear brands along with Kookaburra, Penguin and Speedo. His designs were adopted by lifesaving clubs and during the Sydney Harbour Bridge opening celebrations in 1932, the marching surf lifesavers wore his Black Lance designs. But perhaps his most famous design, for which he won a long battle for its world patent, was the square buckle belt over the woollen trunks immortalised by Superman. Seagull men’s trunks. ANMM Collection 00009443. But Peter loved change and new challenges, and as he grew tired of the fashion world, he sold his knitting mills and re-invented himself once more. After WWII, O’Sullivan established a chain of 25 delicatessens before moving into the Real State business in the 1950s. In 1963, he acquired several properties at Woodend, near Melbourne, and began breeding Murray cattle. One of his properties, Cadella Park, became the largest Murray cattle stud in the country. Explore more of our swimwear collections online and at our Google Cultural Institute page.